'Ghazala' by Mameli-Badi, Alla Budabbus and Takwa Barnosa. The first exhibition of its kind internationally, Retracing a disappearing landscape is a six-week exhibition exploring memory, personal history and collective narratives relating to modern day Libya. Across large curated spaces, the exhibition displays the art of over 25 individuals with ties to Libya. Pieces of bright crimson and white cloth hang from a thin rope. Under the white lights of P21, the intricate detailing of the cloth suggests that it is certainly not ordinary. Weaved with cotton and mixed with silk and silver thread using geometric designs and symbols, the cloths revive a unique form of weaving called the pomegranate seed weave. Originating in the capital city of Tripoli in the 1800s, the pomegranate seed weave was widely practised in different cities in the past and passed down family lines. Created by the only remaining woman in Libya to master the weave, Najat Abeed, the installation positions itself firmly as a witness to the changing of the Libyan landscape. The result is a piece of art that almost sends a stress signal about its vulnerable position as a tangible, palpable emblem of Libya, now facing the risk of fading away. Opposite Abeed’s 'Pomegranate seed' is 'Ghazala', an installation by Marcella Mameli-Badi, Alla Budabbus and Takwa Barnosa. The installation reminisces an iconic landmark of downtown Tripoli which mysteriously disappeared in 2014. The silhouette of the Ghazala fountain, Sculpted as a lady hugging a gazelle by the Italian sculptor Vanetti in 1933, is replicated and surrounded by different words in Arabic such as "loss" and "destruction". The country's tumultuous history is not only acknowledged but also accepted in Ghazala, combining the outline of a colonial past with the influence of social media and Language in making sense of the past. Using a mix of ceramic, photos, visual art and archival material collated through social media, the landmark is collectively commemorated and remembered by Libyans. The installation draws upon the tragedy and loss of an iconic landmark to create a piece of art that evokes hope and happiness, shifting the uncertainty of its unknown fate from a place of mystery to that of acceptance and hope. 'Ghazala' demonstrates the power of memory by showcasing a multi modal installation that embodies, in a raw and physical sense, both personal and collective memory. Libya's colonial history resurfaces in the backdrop six small images of Libyan women in 'Dearest To Me', an amber resin installation by Laila Sharif. Partially visible, Italian sentences can be seen behind the semi covered faces of the women. Archives of black and white pictures from family albums dating back to the 1900s are placed opposite the resin installations; almost as if to demonstrate the persistent duality between the female and the family, referring to typical Libyan habits as well as local traditions from the past. By using amber, 'Dearest to me' places these women’s personal stories in permanence, alluding not only to the power of artistic ability, but perhaps the powerful hold of family relations and social conventions as well. Metres away from Laila Sharif’s installation the focus sharply shifts from women to men. Featuring photographs taken by photojournalist Guy Martin, 'The Missing: Re-Photographed' cuts through the warm amber hues of Sharif’s own depictions of Libya in the past with posters printed in blue and red, a faded pink cast visible across the faces of different men. 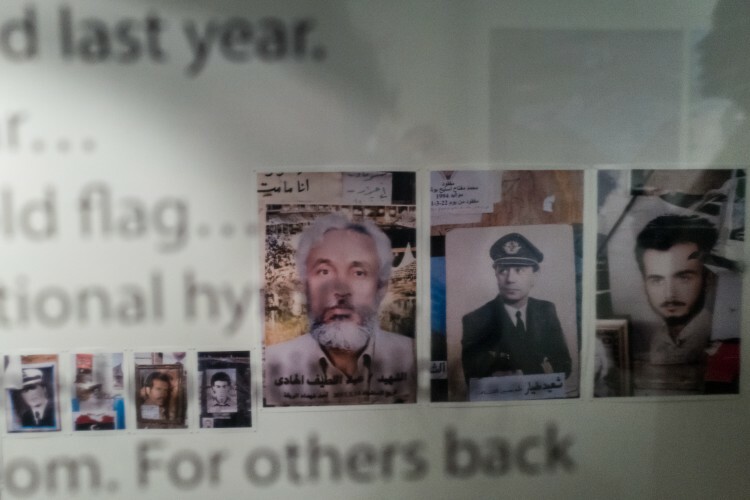 Displaying the names and faces of men who went missing during the revolution, the same posters were once plastered onto the walls of a courthouse in Benghazi in 2011 by locals and families in the hopes of them being found. Now reproduced, the images serve as a visceral reminder of the pain and loss caused by war and destruction. This is heightened by an uncertainty towards the men’s fate. We sense that those men are still missing, for no mention of their fate is made in the installation. The pervasiveness of uncertainty lingers throughout the exhibition. Looking up from the images of the missing, one can see an excerpt of Jihan Kikhia’s film, 'Finding Kikhia' being played. The documentary film tells the story of a family’s search in relation to the disappearance of the director’s late father, Mansur Rashid Kikhia. In the short reel, we see Gaddafi walking across a shore. Seconds later, Mansour Kikhia and his wife can be seen sitting together on swings in a park. Celebrations during the revolution are also played, before the video cuts to an image of a car being towed. Often moving between the personal and the public, 'Finding Kikhia' is an incredibly intimate film that witnesses the personal becoming the political. Ceramic polaroids by Marcella Mameli-Badi. During times of tragedy and loss, conversations and humour can bring people closer together. Sometimes, such connections become the landscape, the collective memory that presents itself as a characteristic of a country’s history. This comes across in Malek Elghwel’s film, 'Mendar', (the name for mattress in the Libyan dialect). In the video montage, a popular Libyan cartoon, Besbasi, talks about the different eras of Libya, going as far back as the Greek Empire. Moments later, Besbasi can be heard describing Libya as “a country where people do nothing, but eat lotuses”. Images of watermelons, which are very common to Libya, are displayed throughout the video, alongside images of men and women in traditional Libyan clothing. 'Mendar', created with reference to the structural rhythm and classic form of a Sonata, harmonizes personal and collective memory through allowing both past and present to be united by a recurring sound and sentiment. Visually, the exhibition basks in a multimodality that almost allows for time to be slowed down. The often fleeting, day to day moments of those with connection to Libya are placed against a backdrop of a deeply explored landscape. A parallel programme running alongside the exhibition, featuring talks from the artists and other professionals with ties to Libya, promises an open space for meaningful discussion and exchange surrounding Libya's contested history and personal expression. 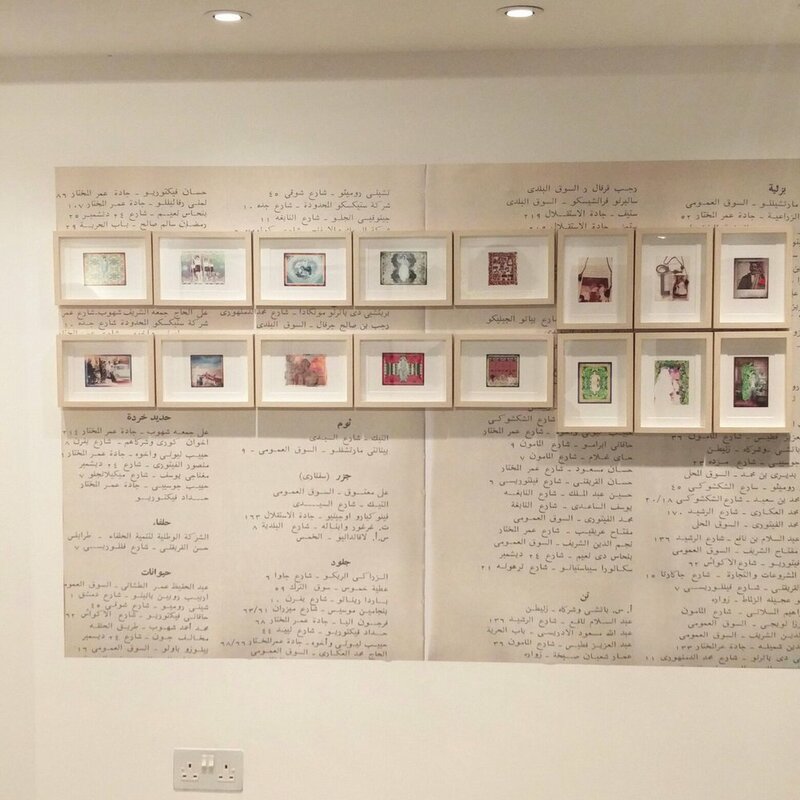 Najlaa Ageli’s exhibition, while sad on the surface, is a positive one. It shines a light on a country’s history that was once isolated in darkness. 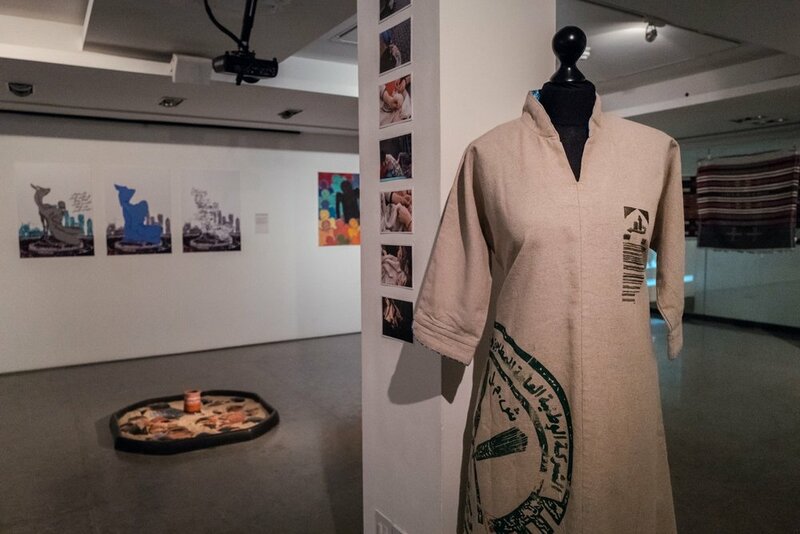 By showcasing the exhibition in London, Ageli has already succeeded in passing on the seldom discussed memories of Libya’s past to a large and international audience. It seems that Libya is ready to be revealed. Retracing a disappearing landscape is currently on display at P21 Gallery, 21 Chalton St, Kings Cross, London NW1 1JD, from 30th March until 12th May.